The Pepsis wasp(Pepsis formosa) has a blue-black body, 6 long legs, a pair of long antannae.and large bright orange wings. It is also known by another name, the Tarantula Hawk Wasp. These wasps require a tarantula to serve as a host or 'meal" for their larvae. The female wasp will look for a burrow that contains a tarantula and then disturb the webbing around the burrow to coax the tarantula to come out. She stings the tarantula on its underside paralyzing it and drags it down into a burrow. She lays one egg on the paralyzed spider and seals the opening to the burrow. When the egg hatches it eats the still living spider. Fifteen species of Pepsis are found in the United States, nine of those occur in the desert. 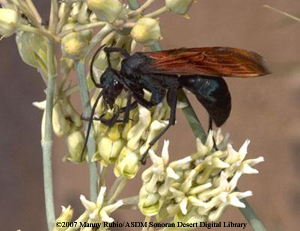 As their name suggests, tarantula hawk wasps will be found where ever you can find tarantulas! Currently they are not endangered or threatened. Adults feed on nectar and pollen while the larvae feed on tarantulas. Very few animals will try to eat this wasp due to its stinger. Both the roadrunner and bullfrog are two of its predators. They are most active in the summer although they do try to avoid the hottest part of the day. They are found around flowers or on the ground in search of prey. Males live 1-2 months, females live longer. These wasps can get up to 1.75 inches in length. This wasp is not considered aggressive, but it does have one of the most painful stings of any insect. It's bright wing color may be a warning to leave it alone or else! The tarantula hawk wasp is the state insect of New Mexico.